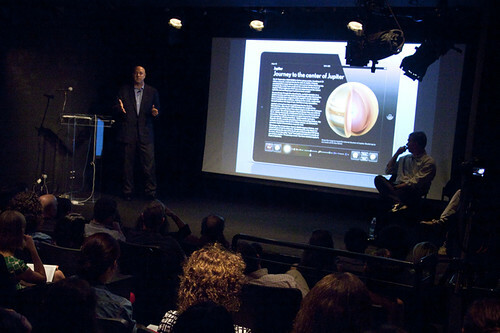 Thanks to everyone who turned out for the "These Guys Kick Apps" event at the Helen Mills Theater in Manhattan last night in which speakers from WoodWing, Seven, TRVL and Joe Zeff Design provided a global perspective on how independent publications conceive and construct apps for the iPad. Following an overview of WoodWing from channel evangelist Jeff Gapp, Mike Burgess from Seven in London shared 15 lessons learned from creating amazing apps like Project, the joint venture between Virgin and his company. Jochem Wijnands and Michel Elings from TRVL in The Netherlands presented their inspiring story about how the two of them built a successful company out of their spare bedroom, and showed off their current redesign. And Joe Zeff of Joe Zeff Design offered insights into how entrepreneurial individuals can create not only apps but brands, and revealed a sneak peak at its next edition of its Above & Beyond series, Above & Beyond: John Kascht. Congratulations to the Society of Publication Designers, and in particular Emily Smith, Josh Klenert and Bob Newman, for producing an amazing event. SPD plans to have video soon on its site, and has posted a photo gallery by Marcus Leitch. Meanwhile, the Joe Zeff Design video is on YouTube: Part 1 and Part 2.